In the previous update I already shared with you the challenges that come with having no urgent deadlines or brief shots of adrenaline after every email, phone call or meeting. This week I had even more trouble finding my productivity. A few days passed filled with procrastination while trying out things to find my new rhythm. Going to a coffeeshop, co-working space or just outside (we were lucky with a few sunny days) did help to get some things done. The question I try to answer for myself is, when do I feel productive? It has always been a feeling of ‘being in the zone’ or ‘being present’. One of the EY leaders once explained to me that his definition of work-life balance is when he is fully present in the activity he is engaged in at that time. Enjoying the family when he’s home or on the phone with them as well as giving his full attention to the board meeting or the conference call he is dialling in to. I applied this concept not only to feeling balanced but also to being productive (after all you can only be truly productive when your thoughts are focused on what you’re doing). And this is exactly the feeling I’m lacking for the past two weeks. When I’m trying my hand on design I want to be learning to code and when learning to code I want to read a book. The only activities where I feel I’m truly present is with friends and family and while running. I feel strongly that these feelings and thoughts bring me closer to true intrinsic motivation for what I’m doing and doing only what I feel strongly motivated for. With a fixed end date for my sabbatical I probably wouldn’t have had these feelings so I see this as a luxury and benefit of taking a sabbatical: a healthy struggle which I have to go through. 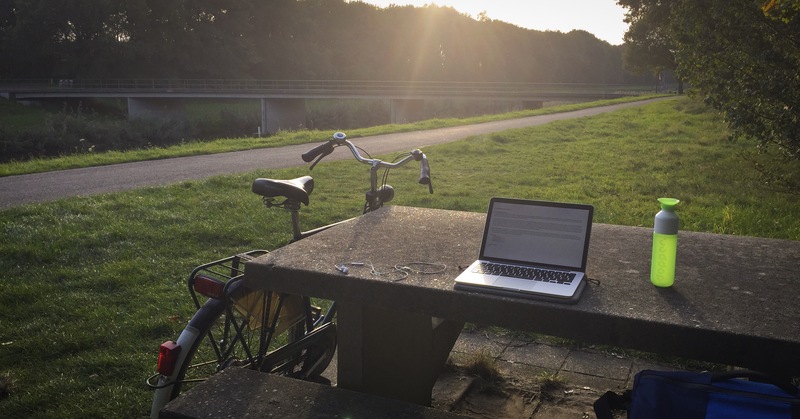 I went out cycling yesterday and today to find a spot in nature where I could read, write or create. I didn’t find a good spot for that yesterday but today something happened. While cycling, the journey became the destination. Slowly I started to feel some inner quiet to start doing the things I so badly want to do. That’s when I sat down and wrote this update. Will week 4 start to see increases in productivity? I will let you know next week!